Two years ago, Earth received the light from a distant supernova. A star had collapsed into a black hole and triggered an intense gamma-ray emission, known as a gamma-ray burst (GRB). This emission was created by a jet of material released by the dying star. The evolution of that jet was captured in a series of observations by the Atacama Large Millimeter/submillimeter Array, otherwise known as ALMA. ALMA tracked the jet over a few months and put the images together to create the observatory's first time-lapse. As reported in the Astrophysical Journal, researchers were able to study the reverse shock, which is caused by the jet slamming into the material around the star, creating a shockwave that travels backward through the jet. This is not the only insight the team got from the observations. Millimeter wavelengths of light appear to be ideal for studying the conditions created by the jet, and there’s plenty to learn. The researchers were able to study the geometry of the jet, and by combining this with information about its duration, they estimated the energy released. It was equivalent to the amount of energy our Sun puts out in a billion years. 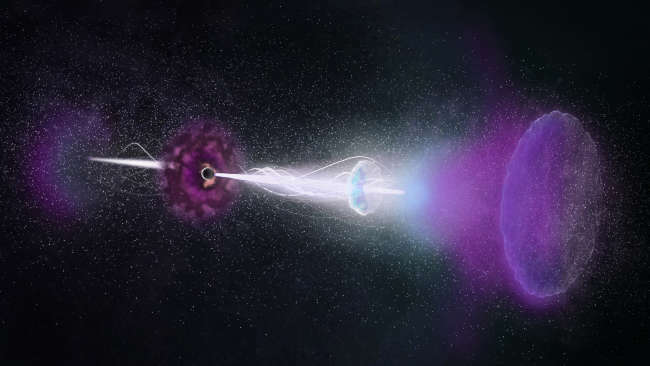 This is only the fourth gamma-ray burst reverse shock that has been observed convincingly in more than one type of light. The star was in a very low-density environment; the gas around it was 3,000 times less dense than what we normally find around stars in our own galaxy. The researchers suggest that maybe this is the reason why these events are so rare.